You are two months old and although it feels like the time has flown by, it has been the most intense two months of my life. I always planned on writing a monthly letter to you but it is proving difficult, especially the first month when you weren’t even home yet and it was a month of intense joy and more intense fear. Gabe, you decided it was time to arrive long before you were ready. Bea tagged along but seemed more prepared. Daddy and I weren’t ready either and we were stunned and confused by the arrival. I always heard to be prepared ahead of time but as you probably now know, I like to call the shots and thought that I could control this too. Both of you were the most beautiful babies in the world. Even the nurses and doctors at the hospital said so. Neither of you looked like premies at all just very small perfect babies. Gabe came first at 1:40 am and weighted 4 lbs 3 oz and Bea at 1:41 am and 3 lbs 11 oz. Both of you had tons of dark hair and I wondered how you could be our babies but as the days past you looked more and more like family and even if you weren’t mine it was too late…I was in love!! The first week neither of you had any real problems and it seemed we might not have to be in the hospital for long. 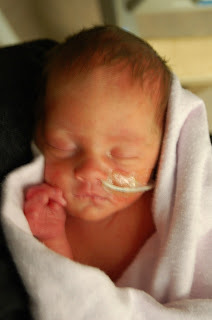 At exactly one week old, Gabe got sick and transferred to Sick Kids. This was the worst day of my life! Before I even had a chance to look at you both at the same time, you were in isolettes across the room from each other at St. Mikes, Gabe was off in another hospital. Before the end of the day they had diagnosed what was going on your tummy Gabe but over night it got worse and they did the surgery the next day. Your dad, Gramma Robin and I sat in the waiting room for three hours waiting. 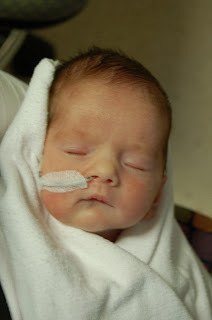 I just couldn't believe this was happening to my brand new little boy. Daddy’s cell phone kept ringing, the whole family was so worried. We found out later that the surgeon that did your surgery is world famous and had separated Siamese twins before. After the surgery you were at Sick Kids for another two weeks and Daddy and I and sometimes Gramma Robin spent our days traveling back and forth giving you both as much love as we could. Gabe, even though you had been the sick one, you learned to eat long before Bea. You would power back your whole feed from a bottle while Bea, you would get about half way and fall asleep. Bea, you struggled with latching but once Gabe realized where a meal was coming from he found a way to attached himself. The end of our stay at St.Mikes was only about getting feeding down and it was nice to relax and start to get to know you both. I have gotten to know you better and better every day and you two are the neatest little people. Bea, you are the comedian. You are constantly mugging and making faces. You are noisy, grunting and groaning along with your coos and squeals. You are always making everyone laugh. You want to snuggle all the time and sleep better if Daddy and I let you sleep with us. You like nothing more then being held tightly. You are a very pretty little chub pot that is only just learning to look at people directly. You are way ahead of Gabe on holding your head up and hand eye coordination. We are sure that you will be turning over soon. That and you can fart like a full grown adult. Gabe you are sweet curiosity. We can sit you up on the couch on your own and just let you look around. When held you stare deeply into your cuddlers eyes especially if they are feeding you. You are a bit of a spitter-upper and we have had to be careful how soon we put you down after a meal and about burping you but you are a strong eater which makes this whole process easier. You also don’t mind sleeping alone and will sleep the first stretch of the night in the crib in Mommy and Daddy’s room alone. As nice as it is that you are so independent, I think your dad and I both hope that once the ostomy has been reversed that you will like to snuggle up as much as Bea. You aren’t as verbal as your sister and only make noise if you have something to say. I am tired, you guys are up every 3 hours to eat but I am crazy about you and miss you while you are sleeping. Just please give me enough time to write these notes to you cause I don’t want to forget a thing.